Amazon has been awarded a patent for a giant flying warehouse that acts as a launchpad for drones to deliver items within minutes. The U.S. e-commerce giant described plans for an "airborne fulfillment center" (AFC) such as an airship or blimp that would float at an altitude of around 45,000. The airship will be stocked with lots of products. When a customer places an order, a drone or unmanned aerial vehicles (UAV) will fly down and deliver the package. Amazon insists that this would require little power because the drone would be gliding down rather than having to take off and land. "When the UAV departs the AFC, it may descend from the high altitude of the AFC using little or no power other than to guide the UAV towards its delivery destination and/or to stabilize the UAV as it descends," the patent filing explains. Amazon's filing reveals several uses for the warehouse blimp. One example is at a football match where customers may want certain items such as food or merchandise. Ahead of the game, the AFC could stock up on items and deploy these during the game with drones when they are ordered. The airship could also be used as a giant advertising board, allowing customers to order the items on display. All of these can be ordered "within minutes". The drones would be able to communicate with each other via a mesh network to give information such as weather and route. UAVs could also recharge on the airship. Amazon's filing explains that the blimp would remain in the air and be refueled and replenished using a shuttle. This could be a smaller aircraft capable of docking onto the AFC and unloading products as well as fuel. Amazon began testing the service in the UK earlier this year, completing its first delivery in Cambridge on December 14. If this plan saw the light of day, Amazon would likely need regulatory approval from aviation authorities which could be complex. The patent filing was awarded in April this year but only circulated this week after CB Insights analyst Zoe Leavitt found the document and tweeted it. 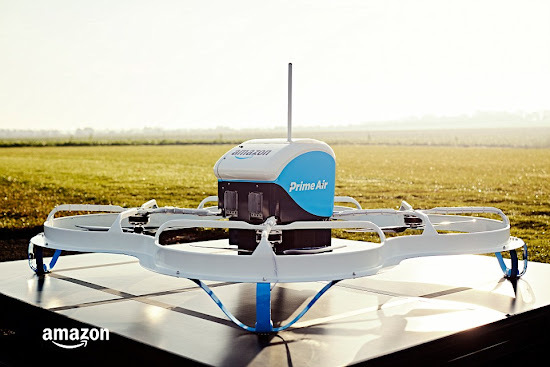 It's not the first patent that Amazon has been awarded regarding drone deliver. 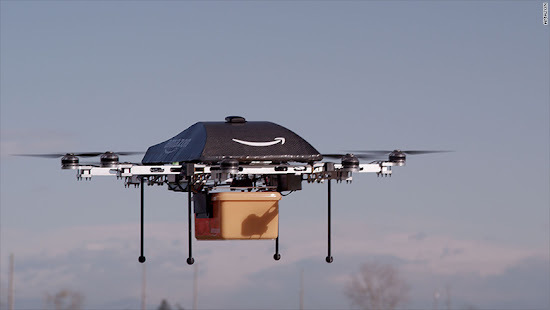 In July, a patent showed how Amazon was thinking about tall buildings and structures such as lampposts or churches as docking stations for drones to recharge. Another patent described how drones would "talk" to each other to plan routes and communicate. 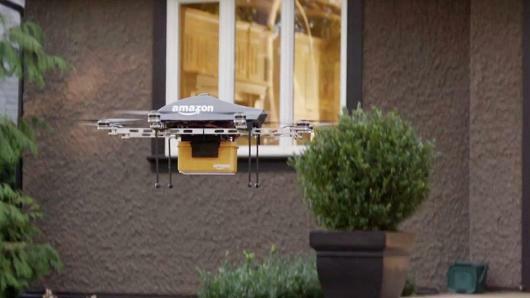 Amazon successfully trialed its first delivery by drone in the U.K. earlier this month and is pushing ahead with plans to make this widely available. The U.S. firm files and is awarded many patents but it does not necessarily mean the ideas will become reality.